Indonesia says it hopes to hold formal peace talks with separatist rebels in the province of Aceh - the region worst hit by the Asian tsunami. Foreign Minister Hassan Wirayuda said he hoped to start talks later this month - the first since May 2003. The Free Aceh Movement (Gam) has been waging a rebellion against the Jakarta authorities for nearly three decades. But in the wake of the tsunami, both sides agreed to an informal ceasefire to help ease the distribution of aid. About 115,000 people were killed and some 800,000 made homeless in Aceh and North Sumatra as a result of the tsunami disaster. Mr Wirayuda told a press conference on Wednesday that informal negotiations had been taking place with Gam rebels for some time. "It is our hope ... that there will be a [formal] meeting by the end of this month," he added. He said the tsunami had increased efforts to solve the long-running dispute. Both sides have accused each other of breaking the pact agreed after the tsunami, but there have been no large-scale skirmishes since the disaster. The proposed talks would be aimed "at strengthening the gentlemen's agreement which is now more or less in place," Mr Wirayuda said. But a BBC correspondent in Aceh, Rachel Harvey, said no precise date had been given for the talks, nor any confirmation of whether outside mediation groups would be invited. It is also not clear whom the government has been talking to inside the rebel movement, she adds. The likely location for such a meeting is also yet to be announced. Many of Gam's senior leaders are now in exile in Sweden. 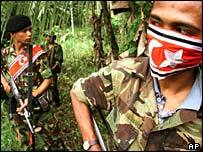 One rebel commander in Aceh contacted by the BBC said he had heard nothing about any negotiations. He said he had only been told by Gam's leaders in exile to observe a ceasefire. Formal talks between Gam and the Indonesian government were last held in May 2003. When they broke down the government imposed martial law, and thousands of soldiers were sent into Aceh to enforce control. The martial law was finally downgraded to a civilian emergency last year. Meanwhile aid workers in Aceh are still struggling to cope with the scale of the disaster wrought by the tsunami on 26 December. Fatality rates in some areas are more than 75%, according to the United Nations' Office for the Co-ordination of Humanitarian Affairs. Some 40,000 people are still missing in Aceh, far more than first thought, President Susilo Bambang Yudhoyono said on Wednesday. "There are about 500,000 homeless people in the emergency camps, and thousands of tsunami orphans. Perhaps we will never know the exact scale of the human casualties," he added.